Heartland Mini Hoofs has given us the opportunity to create a mini horse family to bring joy to others. Can we teach our children to be open to new experiences? Horse enthusiasts Andra and Morgan Ebert believe children should be armed with the ability to accept change instead of fearing it. This lesson will help young children to be better equipped to handle life’s biggest surprises as they grow and mature. 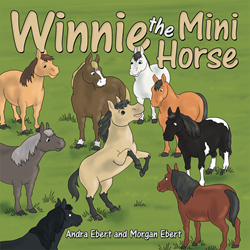 The Eberts’ new book Winnie the Mini Horse encourages children to be receptive to new opportunities and to making new friends. Winnie the Mini Horse is the newest horse at Andra Ebert’s Heartland Mini Hoofs, a miniature horse therapy visitation program. The star of the Eberts’ new children’s book,Winnie has made trips to nursing homes, hospitals, Alzheimer units, and schools, and many other venues as a therapy horse. “After spending so much time around horses, we learned a lot about their herd mentality, as well as their fun-loving and gentle nature,” Andra said. “Heartland Mini Hoofs has given us the opportunity to create a mini horse family to bring joy to others." The Eberts continue to travel Illinois with Winnie and their other therapy horses. They hope to not only give back to the community, but to also showcase the immeasurable benefits of therapy horses. For more information, visit winnietheminihorse.com. Andra and Morgan Ebert share a passion for horses of all sizes. After many years of experience in riding and showing large horses, they have entered the world of miniature horses. Andra obtained her bachelor’s degree in social work and master’s degree in gerontology from University of Illinois, Springfield. She founded Heartland Mini Hoofs, a miniature horse therapy program, in 2014.